Charged with a criminal offense? 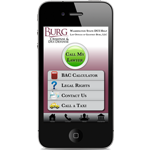 Burg Criminal Defense can help you. This web site is designed to give you information about the crime(s) you are facing, the expected court procedures, and the potential penalties and risks you are facing. However, this is only a beginning. Geoffrey Burg & Patricia Fulton Attorneys are experienced in defending almost any criminal charge. As you navigate through this web site, you will notice that we have listed many Washington State criminal offenses. We have helped people with all types of charges. No matter what charges you may be facing, we are happy to meet with you to discuss your case and options. After talking with you, if we feel there is someone who would be better able to help, we can help you connect with the best lawyer for you and your case.